As we prepare to celebrate the Feast of the Nativity of our Lord Jesus Christ, it is good to meditate on some of the types and symbols of His Birth in the Old Testament. One of the most beautiful foreshadowings of the birth of Christ can be found in 3 Kingdoms 8:26-30 (LXX). 1 In this passage, the Holy Prophet-King Solomon, the son of the Holy Prophet-King David, had just finished constructing the magnificent Temple in Jerusalem according to the specifications set forth by the Lord Himself. So splendid was this Temple that all were in awe of it because of its sheer beauty and magnificence. Afterwards, Solomon summoned the Jewish people and their elders for its consecration. The Ark of the Covenant, that holy relic wherein the Lord chose to dwell with His people, was solemnly brought into the Temple accompanied by the majestic sound of trumpets and spiritual songs. Suddenly, behold! The glory of the Lord descended in the form of a cloud, filling the whole interior of that beautiful Temple. Even the priests who were used to ministering before the holiness and majesty of God could not continue due to the awe that inspired them. And now, O Lord God of Israel, let, I pray Thee, Thy word to David my father be confirmed. But will God indeed dwell with men upon the earth? if the heaven and heaven of heavens will not suffice Thee, how much less even this house which I have built to Thy Name? Yet, O Lord God of Israel, Thou shalt look upon my petition, to hear the prayer which Thy servant prays to Thee in Thy presence this day, that Thine eyes may be open toward this house day and night, even toward the place of which Thou saidst, My Name shall be there, to hear the prayer which thy servant prays at this place day and night. And Thou shalt hearken to the prayer of thy servant, and of Thy people Israel, which they shall pray toward this place; and Thou shalt hear in Thy dwelling-place in heaven, and Thou shalt do and be gracious (3 Kgdms 8:26–30). Let us meditate on Solomon’s question to the Lord: “Will God indeed dwell with men upon the earth?” He goes on to explain in all humility, “If the heaven and heaven of heavens will not suffice Thee, how much less even this house which I have built to Thy Name?” In other words, will God, the Creator Who fills all things and cannot be contained, accept to dwell with His own creation? 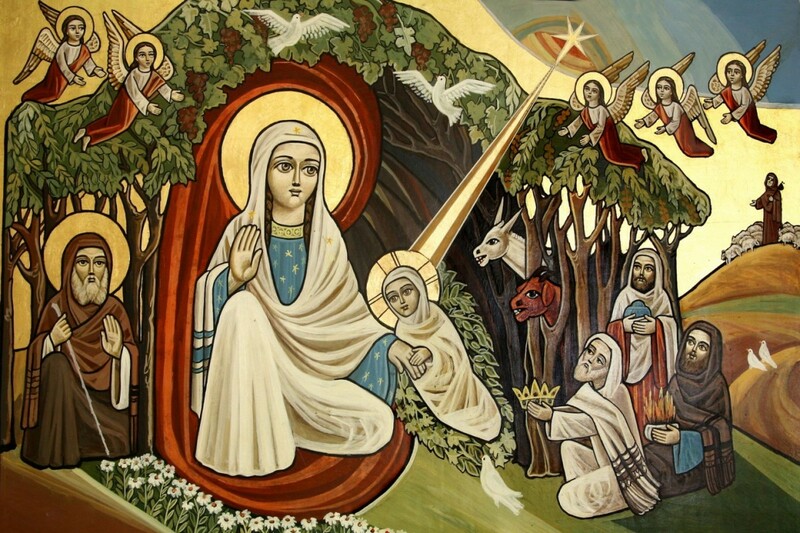 The answer to this question was given by the Holy Prophet Esaias in his beautiful prophecy, “Therefore the Lord himself shall give you a sign; behold, a virgin shall conceive in the womb, and shall bring forth a son, and thou shalt call his name Emmanuel” (Is 7:14). The name Emmanuel, of course, means “God with us.” In the Gospel, this prophecy is repeated to the Holy Joseph by an angel of the Lord shortly before the Holy Virgin Mary gave birth to our Savior. These Holy Fathers are presenting only some of the fruits of our Lord’s Nativity — nearness to God, deification, renewal of our nature, and immortality. It is good for us to meditate on these gifts and ask ourselves what we will offer in return. On the night of His glorious Birth, the Magi offered Him gifts of gold, frankincense, and myrrh, but what about us? As we begin this new year, 2016, will our lives be any different? Will we make Christ a priority this year? Or will we continue to allow the world and its cares to compete with Him for our hearts? 2 Responses to "God Dwells with Us Forever"